Sorry we've been incognito for so long. MH's mom had some medical problems and we moved up to help her out. Its kinda neat here, once I got used to the idea that I could go outside (Love laying on the back porch in the sun, we couldn't do that in the old place.). When we moved we got with a few of the rescues in the area and managed to bring 25 cats and kittens from a kill shelter area to a no-kill area (Dont think they liked the trip much, but a friend of MHs stayed in the back with them). Virago stayed with us until the doorknob kittens (The five siamese someone left hanging on our doorknob in a plastic sack and towel in 30 degree weather, only three survived unfortunately) were old enough. 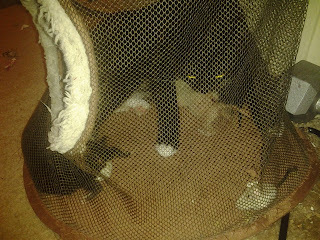 Then she and two of the kittens went to live with MH's sister. 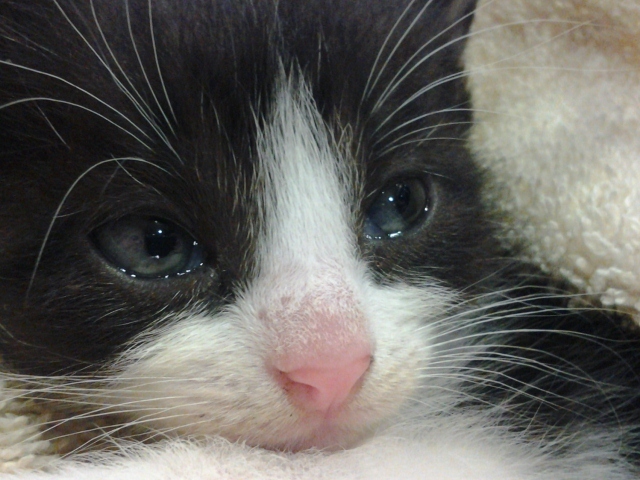 The runt (Sorry Bit) stayed with us and was named Bitty (Since he was a little bit and slept curled in MH's hand when he was little). As you can tell we get along well and are doing great. We'll post some more later once we get some more time. Ok.. Its been awhile since we've been around so here we go. 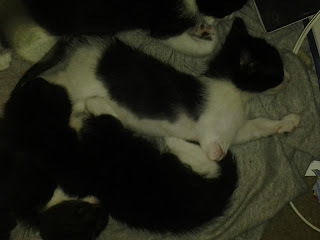 They were tearing a building down at the place MH goes to work, he went out and did a walk thru before they started and found four kittens in there! They hissed and bit at him but he caught them and got them to a friend (Couldn't bring them here, we're full to overflowing) who is trying to socialize them. We'll keep you informed as things go (Oh! Three orange kits and a tortie by the way). MH managed to catch Virago's mom (She was a outdoor cat that we think someone left behind) and she's adapted well to being inside. The only problem is she had a litter of six kittens a few weeks ago and we're having problems finding homes for the older kittens. The good news is we've managed to get thirteen kittens/juveniles adopted so far. Other than that everythings going well. MH is making sure we all stay healthy, get plenty of food and water. We'll try and get some pictures posted soon as he can get the time to download them from his phone. 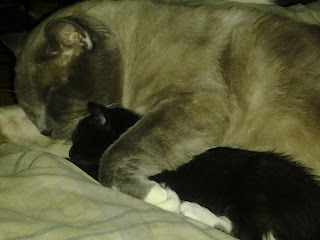 For now we leave you with a picture of Myst and Baby Boo sleeping comfortably. Last Tuesday morning I found two of the cats I had adopted to a lady downstairs on her patio, and none of her stuff was there. 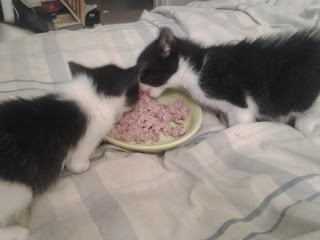 I checked and found out she had moved out so I brought the sisters back home (They went nuts when I got them home checking everyone and you could tell they felt safe again) and they settled in tuesday morning. 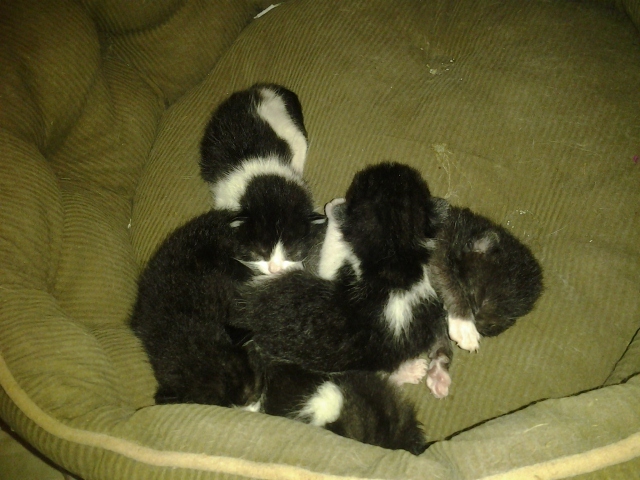 When I woke up tuesday afternoon to get ready for work I found out that Bina (Short for Tabitha) was giving birth to what ended up being five kittens. 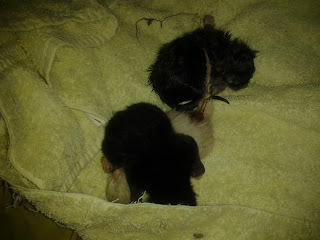 One kitten didn't survive unfortunately. 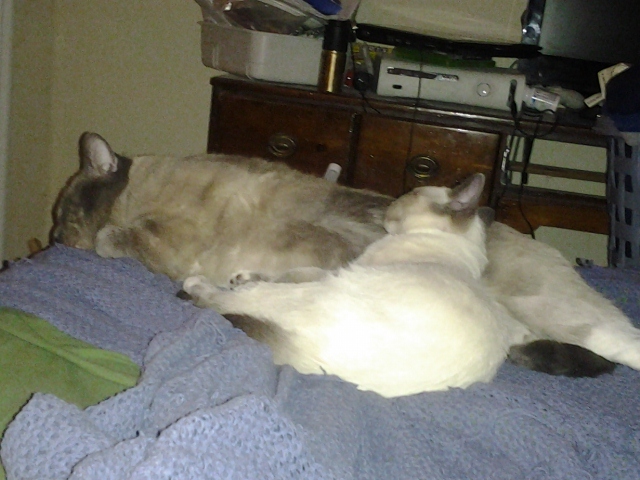 But the other four (Pure white, 2 grey with white socks and a black with white socks) were doing well and Bina finally settled down and stopped moving them around (We made her a safe spot under the bed). Virago is doing well and getting around (and mauling her sibs) quite well. Only time she seems to get irritated is when she can't get up on the bed or climb something (She can't get good traction with only one front paw). Once her sibs are weaned and ready we're going to go with adoptions, Virago will be staying here unless someone special comes in for her. Kinda possessive of the little stinker aren't we? 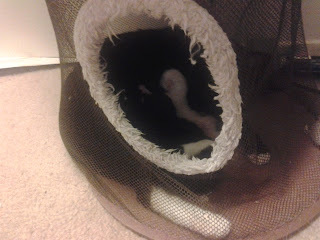 Here's a good view of her right leg so you can see where they had to amputate. Little Virago in her towel while we waited at the vets for her checkup. She looks so thoughtful. Virago is on the left, as you can see she is using her right leg more as a prob when she eats or such. I came home from work yesterday morning to find Virago had somehow lost her right paw (We're thinking it was due to tissue death or infection) so I rushed her to the vet one of the local rescues recommended. Not only were they able to fix her up (Unfortunately she had to have a partial amputation (just below the elbow)) and she's doing well. Is nursing and sleeping well, mama welcomed her home and started cleaning virago and letting her nurse.). Best part is one of the Doctor's nurses wants to adopt Virago! So she has a home waiting for her once she's weaned from Mama. She's in less pain and eatting well. 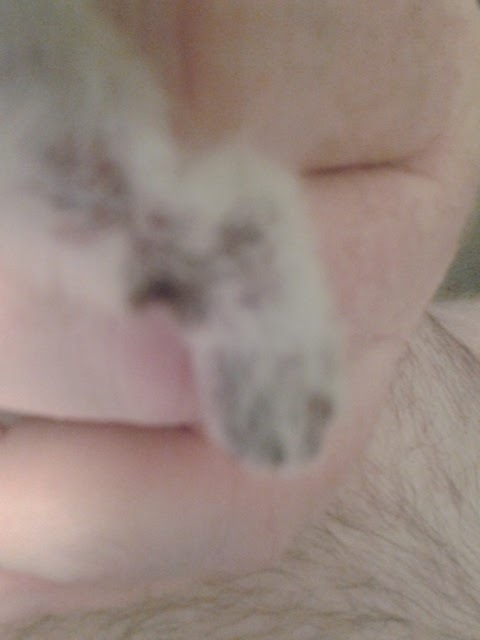 I got some pics of her paw and it feels abit like her other paw, but is looking a bit better to. MH was taking the trash out this afternoon and heard kittens. Tracked it down to a mattress someone had thrown out. He proceeded to get them out of the mattress and discovered one was tangled and had no circulation in her right front leg (Might be broken He's not sure yet since he doesn't want to move her much). He got the tangle off her leg, so we're waiting to see if the circulation comes back. Her name is Virago (Named for his/her lungs) and now that she's named she won't go to the bridge (we're hoping that holds true, no one should leave for the bridge before they can even see the world). She could use all the purrs and prayers she can get and we'll keep you informed. Purrs and Purrayers for Mine Lolove. Long time no see cat blogosphere! I found my Furrever home September of 2006 after being left behind when the others moved.